New 2012/2013 T-shirts arrive just in time for 11th Anniversary Party June 1, 2012! Bar Frida’s unique t-shirts are here and bartender Filipe took a moment to model one for us! You’ll be able to take one home on your next visit to Bar Frida for 150 pesos (the shirt, not Filipe). This year’s design was hand picked by owners Tom and Luis, who will also be celebrating 11 years of serving the coldest beer and best margaritas in town. Come enjoy great food, dancers and a variety of live entertainment on June 1, 2012 at 9pm. If you’ve never attended an anniversary party, you’re in for a great night. If you’re one of the hundreds who are here each year for this event, we thank you and look forward to seeing you! This entry was posted on May 6, 2012 by PVMINGO. 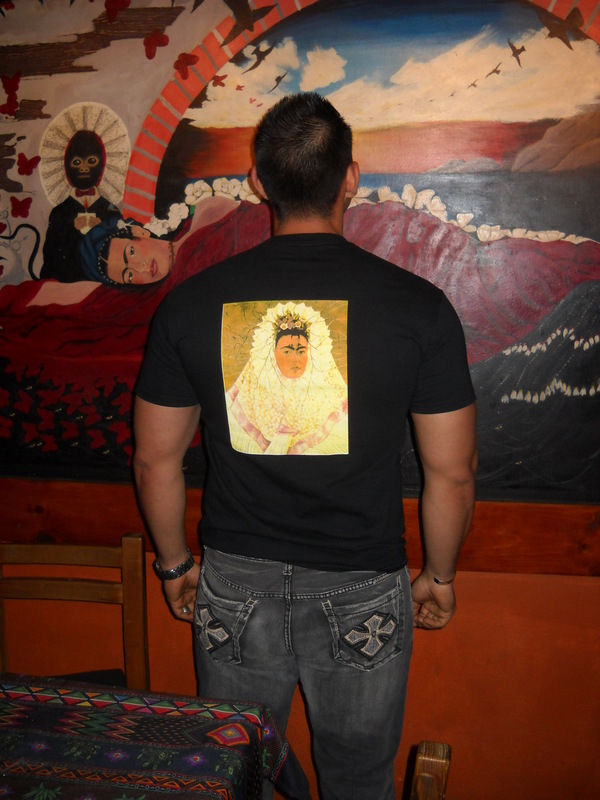 It was filed under bar information and was tagged with Bar Frida, frida kahlo, gay bar, Puerto Vallarta, tshirt.